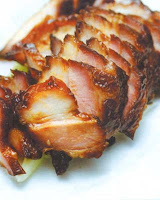 Surprisingly, this char siew is quite easy to prepare. Doesn't mean it tastes as good as the ones in the restaurants though. Get a kilo of pork tenderloin and slice into two strips. Marinate pork at least 3 hours in sauce, turning frequently. Drain pork and place on oven rack; roast at 350F for 40 minutes, turning every 10 minutes to ensure even brownness. If dry, brush the pork with the sauce and oil. Slice into 1/4-inch thickness, sprinkle with toasted sesame seeds. Hot mustard and soy sauce dip optional.